Applesauce is one of the first things I remember learning to cook. I was in nursery school, which puts me somewhere around the ripe old age of three. I don't remember much of the cooking process per se, but I do remember coming home with a folded apple card. The apple had a smiling face. I colored it red. On the inside were directions for making applesauce, the tried and true method of cooking apples down in sugar and water. They were typed on a typewriter. I still have this card. It's resting in my recipe organizer. My name and the year 1985 are scratched in pencil on the back. I dug it out before sitting down to write this. The lesson I learned then, which still holds true now, is that some things are just better homemade, applesauce undeniably being one of them. Applesauce makes great use of apples that have gone soft or have a few minor imperfections. When I went to get my last CSA haul of the season, I had my pick of ten 'applesauce' apples. Some were small, bruised, or had brown freckles. I placed them in my fruit bowl by the window late in the afternoon. If you look closely, you'll notice they're far from perfect. But that doesn't mean they were any less juicy, any less sweet, or any less beautiful to work with. In fact, I think they look awfully pretty sitting there in the sunshine. That hydrangea has been holding on for some time now. It was the last one I cut from our bush about a month ago. Some of you were wondered what I planned on doing with my cranberries from the harvest. I'm holding onto some for the holidays, but decided to add cranberries to my batch of applesauce. They lend a tart flavor that plays nicely off the apple's sweetness, not to mention creates a dark pink mouthwatering color. I also like to add a cinnamon stick to the applesauce while it's cooking, partly for taste, partly to serve as kitchen fragrance. One of the benefits of making applesauce at home is that you can control the amount of sugar in your batch. I choose to add a little maple syrup at the end to sweeten mine. You could add more if you like, or forgo it all together and make a sugar free version. It tastes sweet, slightly tart, and exactly like real-deal applesauce. It's not something you can find on a jar in the supermarket. The applesauce can be served hot off the stove over ice cream or desserts, and also works well in a bowl of oatmeal in the morning. Yesterday, I ate a bowl of applesauce topped with pomegranate seeds, but mostly, I like it cold all by itself. Making applesauce is right up there with making hot apple cider this time of year. It's the little things, after all. Add apples, cranberries, and cinnamon stick to a saucepan. Add water, just enough to barely cover the fruit. One cup was about right for me. Add lemon juice. Cover saucepan and bring the heat up to medium. Let the fruit simmer for approximately 15 minutes until it has softened. Remove from the heat. Discard the cinnamon stick. Mash fruit with a potato masher, leaving it chunkier, or until smooth. Stir in maple syrup. Taste and add more if you'd like. Serve hot or cold. Makes a little over 2 cups. I was talking to a man from England last weekend. He and his wife recently retired, and were traveling across New England. We got to talk over coffee and tea at a bed and breakfast Donny and I spent the night in. This couple rented a car, intending to drive through each state, making stops along the beaches of Maine, the White Mountains of New Hampshire, and the Green Mountains of Vermont. He described the scenes he had seen, the allure of the changing leaves, the quaint towns, and rocky coastline. I realized someone had traveled so far, and quite literally waited all their life, to experience and see what I'm privy to each and every year. I was reminded to appreciate my surroundings not only that particular day, but also each and everyday. I began to watch autumn unfold from a new lens. I caught the way the golden light hits the apricot leaves just right in the early morning. I felt the cool crisp air and chill on the tip of my nose. I noticed the way my hands can't quite get warm unless they're wrapped around a mug of tea. Autumn is all encompassing in that way. You can very much sense the shift happening all around you. This man, I don't think I ever caught his name, was particularly tickled about the pumpkin theme he encountered across New England. Pumpkin coffees and lattes, pumpkin muffins and breads, and our choice of pumpkin ale pancakes that morning for breakfast. I had a serious case of 'order envy' that morning. Order envy occurs quite often in my case. It happens when I'm debating between two menu choices. I mull the choices over in my head, back and forth, back and forth, and under pressure when it's my turn to order, blurt out my decision. As soon as I hear the words leave my mouth, I want to back track. I know I've made the wrong choice. Out of the kitchen comes the meal I let slip away and the envy begins. In this case, stacks of pumpkin ale pancakes had me green with envy. I chose the eggs Florentine in haste. Sure, it was good, predictable even, but those pancakes were fluffy, orange, and piping hot. As I watched everyone else at the table smear them with butter and drizzle them with maple syrup, I thought I would lose my mind. I also thought it would be highly inappropriate to steal a pancake off my new British friend's plate. I had pumpkin ale pancakes on my brain for the rest of the day. And here they are. I made these babies with a combination of whole-wheat pastry and all-purpose flour. While it might be an oxymoron, they're as fluffy as they are dense. I tested this recipe three times to get it just right, which means I've consumed well over a dozen of these pancakes over the last few days. 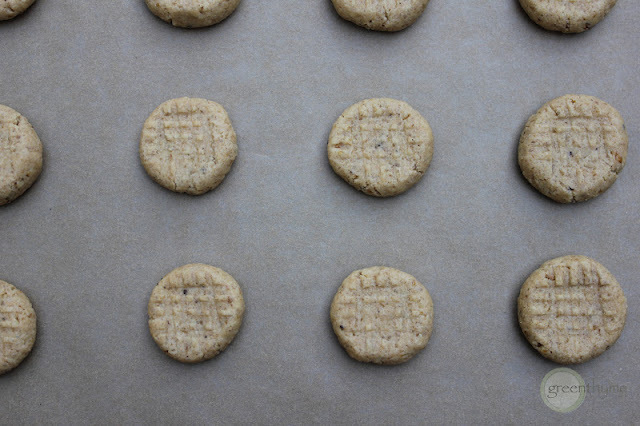 They're spiced with cinnamon, freshly grated nutmeg, and ginger. Best of all, they're spiked with a smidgen of pumpkin ale. I used Shipyard Brewing Company's Pumpkinhead Ale, but any will do. The pumpkin ale barely lingers in the background, but adds that special something you can't quite put your finger on. They cooked up brown and crispy along the edges, just the way I like them. I think I've done them justice. My dog looked pretty envious if that counts for anything. In fact, these might just be my new favorite pancakes. You should know that the last time I included beer with my breakfast was during my 'kegs and eggs' days in college. I've come a long way, baby. 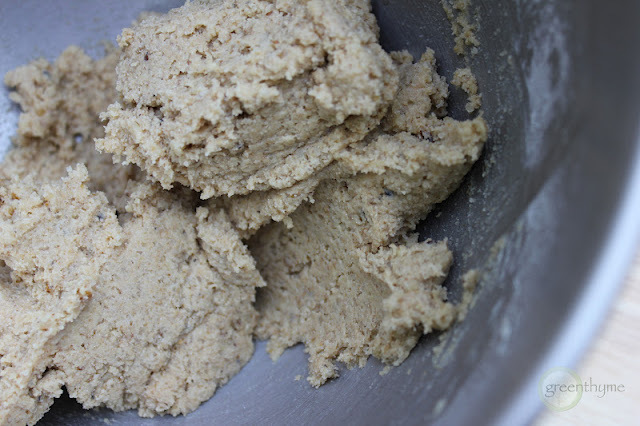 In a large bowl, whisk dry ingredients together (whole wheat pastry flour, all purpose flour, baking powder, cinnamon, nutmeg, ginger, and salt). In another bowl, mix wet ingredients together (egg, pumpkin puree, ale, almond milk, butter, and honey) until combined. Pour wet ingredients into dry, mixing until combined. Add a small pat of butter to a large cast iron or skillet pan over medium heat. I cooked four pancakes at a time, approximately 4" in diameter. Cook on the first side until a little dry around the edges and bubbles begin to form. Flip and cook the other side until lightly browned. Continue until you have used up your batter. You may have to dial back the heat as you make subsequent batches. Serve up with butter and REAL maple syrup. Makes 12, 4" pancakes. Serves 4. ~In other news, my recipe for Mini Black Bean Patties with Cilantro Pesto is included in the premiere issue of Everyday Entrees Magazine for the ipad. To get a free three month subscription to the magazine, use the coupon code "subscribers" and follow the directions below. The magazine will start downloading. Enjoy! I don't drive to Cape Cod very often, although I did spent a week on Nantucket one summer. I drank Nantucket Nectars, polished off ice cream cones, and collected a few more freckles on my nose by the week's end. There was also an unfortunate situation in which I went to dinner wearing a floral jumpsuit and hat only Blossom could have pulled off. Somewhere there are pictures of my ten year old self to prove it. But for the most part, our summer vacations were spent in Maine. My parents did their best to avoid the flock of masses heading south. We went against the grain, heading north to York, Ogunquit, Wells, and Kennebunkport. I decided to revisit the Cape over the long weekend. It's a beautiful time of year to take in the early foliage, but more importantly, it's cranberry harvest season. Having lived in Massachusetts all my life, I've seen pictures of flooded bogs. It's an iconic image splashed in books and on postcards, but I had never seen a bog up close and personal. I pulled onto Cranberry Highway in Wareham on Saturday morning. The southeastern part of Massachusetts, including Cape Cod, is home to more than 14,000 working cranberry bogs. What I pictured to be a small gathering was actually a very large festival with helicopter rides, local artisans, and a cooking demonstration. We took a bus to visit the bogs and headed towards the dry harvest area first. This particular bog is over one hundred years old. I was able to walk onto it to get a closer look. I learned that cranberries grow on low-lying vines, similar to the way strawberries do. They can only grow in special conditions found in the wetlands. Aren't they beautiful? They remind me of Christmas. I also tried a few tart berries right from the vine. The dry harvested cranberries represent the fresh fruit available at farmers' markets and grocery stores this time of year. Amazingly, the dry harvest makes up only 5% of the Massachusetts cranberry harvest. The other 95% of the crop is picked wet and used to make juice, sauce, and sweetened dried cranberries. This scene is probably the one we're all most familiar with, thanks to those Ocean Spray guys. In this method, the fruit is separated from the vines and the berries bob up to the top of the water. The cranberries are corralled together and then travel along conveyer belts to trucks. I never knew so many shades of cranberries existed. After visiting the bogs, we listened to live music and tried a beer sample. Harpoon makes a Grateful Harvest Cranberry Ale right from the very bogs we visited. Harpoon also donates $1 per six-pack of Grateful Harvest to the local food bank in the area in which it was purchased. I love that idea. This raw cranberry honey was screaming my name. It's produced during cranberry pollination on Cape Cod and Nantucket. I took a jar home and can't wait to try it in a cup of tea. And of course, I left with lots of fresh cranberries. It would be a crime not to. I plan on freezing some for Thanksgiving and Christmas. Once I got home, I made a batch of these scrumptious spiced Cranberry and Almond Upside Down Cakes. They're made with almond flour and honey and taste as festive as they look. I have a feeling they'll make another appearance around the holidays, perhaps with a dollop of cashew cream and cinnamon. I have my sights set on this Cranberry Pear Tart next. I'm so happy I got the chance to learn the history behind this amazing, tart, little gem, which also happens to have some amazing health benefits. Be on the lookout for cranberries! Hope you all had a nice long weekend! When I was in Greece years ago, my best friend never ate a single olive the entire trip. "But why?" I kept pestering her. "You don't understand!" I pleaded with her while pointing directly at the trees. "You've never had olives like this before." To which she responded, "I only like the sliced ones that come in a can." My heart broke a little that day. While I was busy dunking bread into glugs of olive oil down at the Plaka, she was busy hunting down black eyeliner to replace the one she lost during the flight. Fashion is her thing and food is mine. I care a lot less about what goes on my body and a lot more about where my next meal will be. We get that about each other. My love for olives increased tenfold during my time in Greece. I've mentioned this trip before, but I can't write about olives without mentioning Greece. Kalamata olives are a favorite but I'll take them any way I can get them; green, black, Nicosia, Sicilian, Manzanilla, you name it. Olive tapenade? Slather it on. 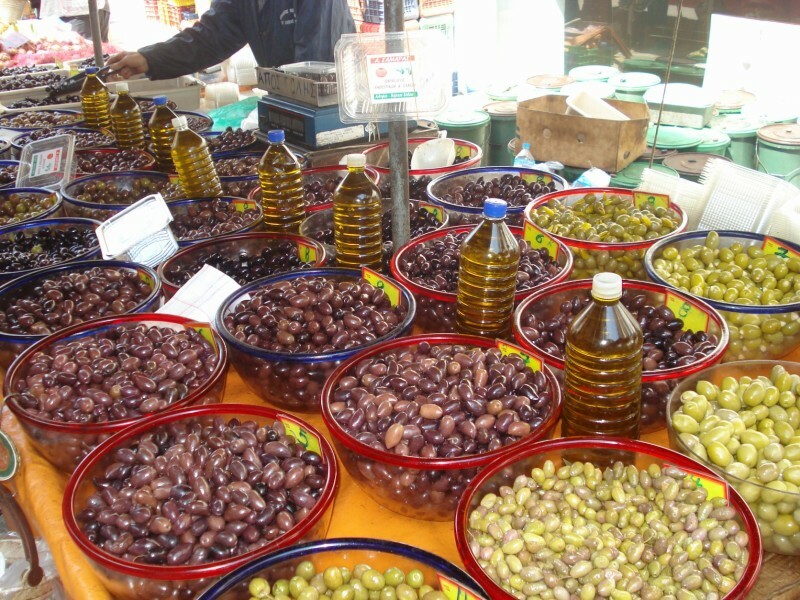 I remember walking around the markets in Athens, in awe of the endless bowls of olives and homemade bottled olive oil. I dug up this photo, taken with my old point and shoot, to give you a visual. I've been buying Greek olive oil and lathering up with olive oil soap ever since. I'm still waiting to turn into a Greek goddess. I know it will happen someday. You just wait. If you've never had olives warmed before, prepare to fall in love a little more. I like to quickly pan fry the olives along with parsley sprigs and garlic. The olives become slick and the lightly browned garlic latch onto them. At first bite, they melt in your mouth. Something about eating them warm, as opposed to snacking on them cold, really brings out their whole, robust flavor. It's quite possibly the easiest appetizer known to man, or god, or goddess. I used Kalamata because I'm very fond of them, but any will do. A combination of black and green make a particularly nice contrast. It takes all of five minutes to throw this together from start to finish. It's fancy enough to put out as an appetizer for a few guests, but easy enough to devour on the couch, spitting pits onto a plate and making a spectacle of yourself. Heat olive oil in a cast iron or skillet pan over medium heat. Be sure the oil is nice and warm and toss in the parsley. Allow it to crisp up in the oil for a few seconds. Add in garlic and give it a stir, taking care not to burn. Toss in the olives, moving the pan around. It will take only a few seconds to warm them through. Remove the olives, parsley, and garlic with a slotted spoon. Serves 4 as an appetizer. This might be my favorite time of year to visit the farmers' market. Summer has ended. Autumn took over, though it hasn't quite set in. The mornings and nights become cooler, but the days remain warm and sunny. Late summer seems to collide with autumn right at this very moment, producing the best of both seasons. Butternut squash and Swiss chard make their appearance, yet eggplants and basil are still plentiful. It makes for a beautiful display of heirloom tomatoes, peppers, crisp apples, and pears. Here's a peak at how I spent last Sunday morning, perusing display tables in the sunshine. I sampled apple cider, bought a handmade headband, and a giant three-dollar yellow heirloom I couldn't resist, despite the fact that I have a mountain of tomatoes at home. If only all mornings could start this way. I am enamored with these teeny-tiny cookies. They're crispy and buttery, delicate and nutty. They're sweet and peppery, and very, very addictive. I polished off the first dozen in lightening speed and attempted to reserve the remaining dozen in the freezer, assuming I'd save them for a later day. But it turns out; their addictive qualities are somehow augmented in the cold. They're perfectly spiced and make me feel all warm and fuzzy inside, almost like gingerbread, but with more pizzazz. The black pepper works beautifully. Don't be timid. I suppose this cookie falls under the 'tea cookie' umbrella. But make no mistake about it; flecked with freshly ground black peppercorns, these offbeat cookies are far from ordinary. 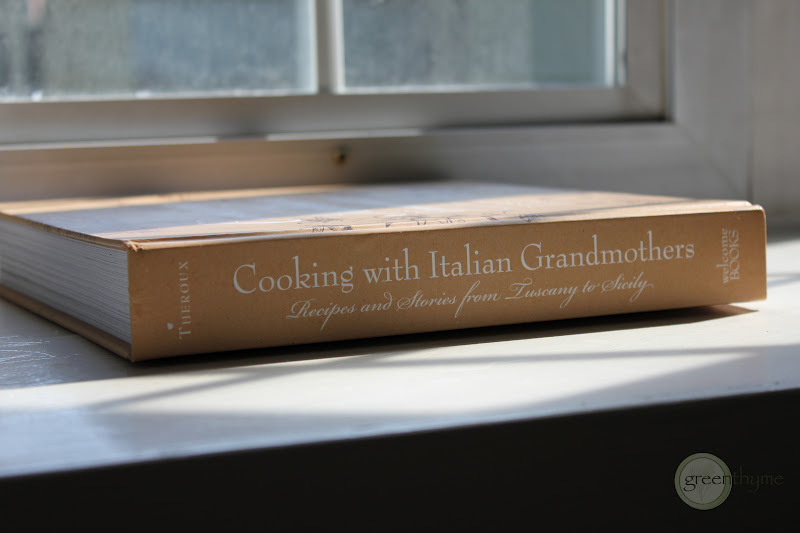 I came across this cookie recipe while thumbing through Jessica Theroux's, Cooking with Italian Grandmothers: Recipes and Stories from Tuscany to Sicily. It's what I refer to as one of the passport cookbooks from my collection, the kind that instantly transports me to a new location. In this case, a simpler way of life in the Italian countryside was my destination. 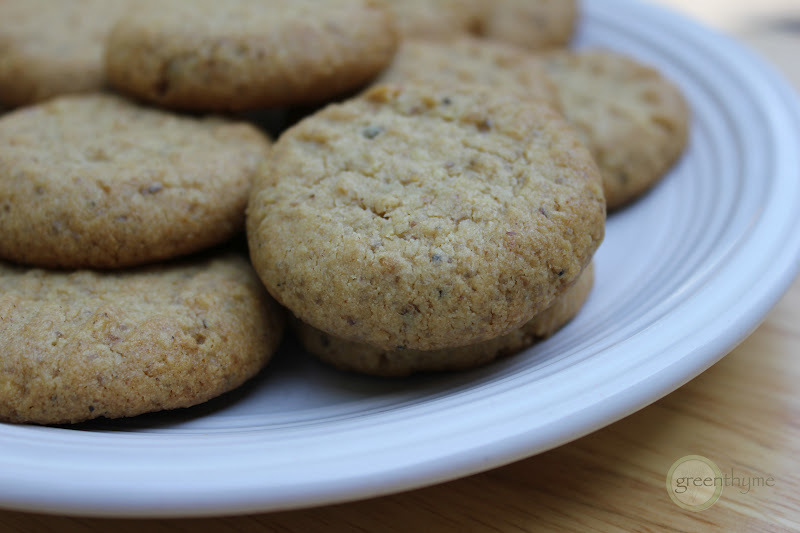 These particular cookies were inspired by an excursion American chef Jessica Theroux took in Calabria. 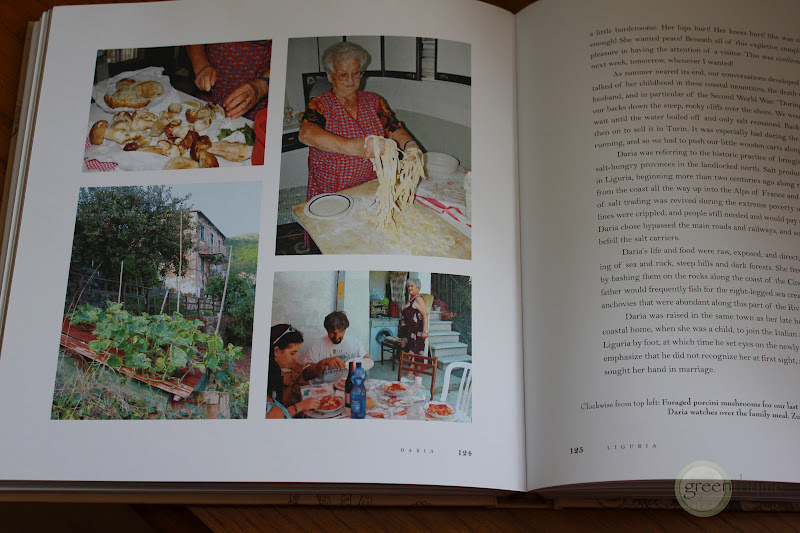 She spent time foraging for black peppercorns during her stay with a woman named Carluccia, one of the Italian grandmothers highlighted in the book. I wouldn't mind spending some time with Carluccia too. I'd be happy to sip on her walnut liquor, nocino, which takes two years to ferment. I'd jump at the chance to forage for peppercorns and walnuts on her land, and giddily roll fresh pasta until I my fingertips went numb. There are some hurdles to this dream of course. I don't know Carluccia's address, and I only know about three words in Italian. Perhaps more importantly, I haven't exactly been invited. And though my bagged organic Trader Joe's walnuts are likely a far cry from the walnuts gathered among the Italian countryside, I can't say I know the difference. They did the job for me. This cookie is as good as it gets in my book. That's got to count for something. Check out the book if you're not already familiar with it. I have a feeling this won't be the last recipe I'll highlight from it. 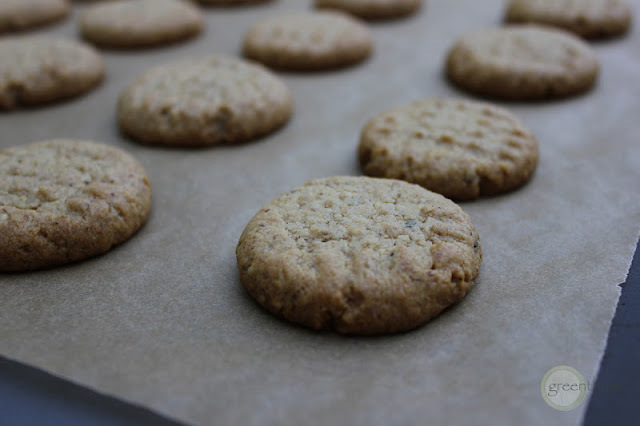 If you try these sweet and spicy cookies, let me know what you think. I have a feeling I've found my Christmas cookie for 2012. Considering I failed so miserably at finding it last year, I'm well ahead of schedule this year. Ciao. Cream butter with sugar until light and fluffy with an electric mixer. Add black pepper, salt, and honey; mixing again to incorporate. Add the walnuts and flour and mix until the dough forms moist clumps, a few minutes. 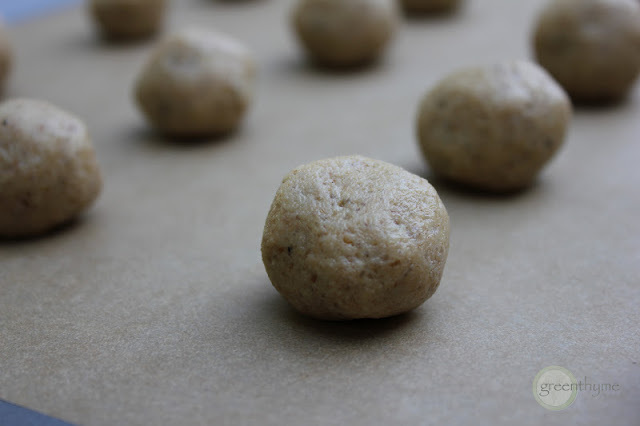 Roll large teaspoonfuls of the batter between your hands, making little balls. Place the balls on your baking sheet and press down on them twice with a fork, making a crosshatch pattern. Bake cookies for 25 minutes or until their bottoms have turned golden-nutty brown. Set aside to cool. Makes 2 dozen cookies. 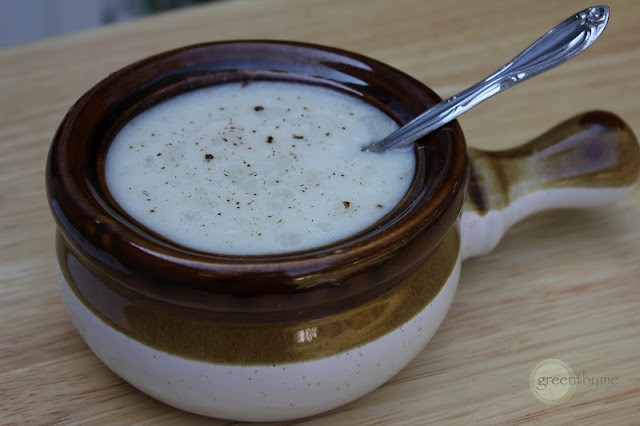 As promised, I'm back with my cauliflower soup recipe. What I can't promise you is that my photos are any better this time around. But let's get on with matters. It goes without saying, if you're not a fan of cauliflower, then clearly this isn't your soup. I happen to love cauliflower. My parents only had to wait twenty-nine years for this to occur, but here I stand a cruciferous convert. I've made this soup twice in the past two weeks. It's a humble soup. It's not flashy. There are no surprises, no magic, and no fireworks. Yes, there's garlic and onion sauteed in coconut oil, but at the heart of it all, it's pureed cauliflower. It's as basic as it gets. Nevertheless, it's all I can think about this time of year. As the weather starts cooling off and the leaves begin falling, I curl up with bowls and bowls of this. I make pureed vegetable soups throughout the year; asparagus, tomato, potato and leek, and butternut squash. They all follow the same format using stock and a few standby staples. 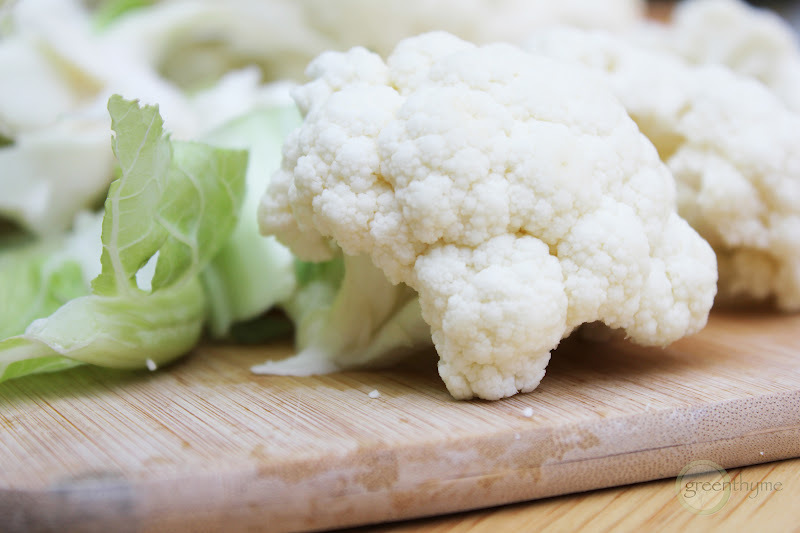 Since there are so few ingredients at play, use the best cauliflower you can find. I'm still getting some beautiful heads of cauliflower in my CSA share. The same goes for vegetable stock. Be sure to seek out good quality. I like to season the whole pot generously with salt and pepper. It has a nice, thick texture, which almost reminds me of potato soup. It tastes clean, pure, and wholesome. Buttered toast makes a nice companion, as does a grilled cheese sandwich. Just in case cauliflower isn't your thing, I'll be back soon with something on the sweeter side. In a large soup pot, add coconut oil, onion, and garlic over medium heat. Saute for about five minutes or so, until the onion has softened. Add cauliflower florets and vegetable stock. Bring up to a boil. 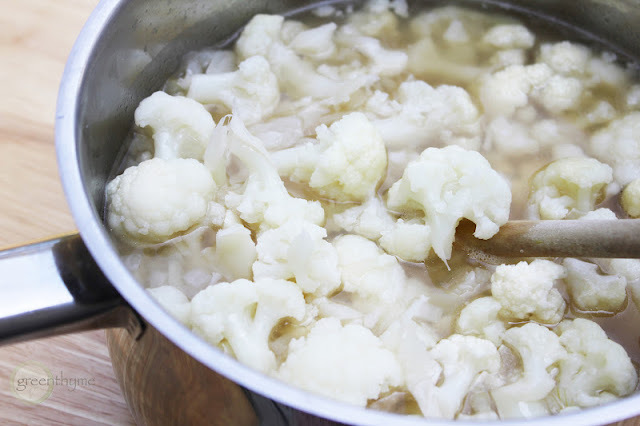 Reduce heat and simmer for about thirty minutes, until the cauliflower has softened. Puree with an immersion blender or in batches in a blender. Add additional stock if you'd like to go thinner. Add sea salt and pepper to taste. Drizzle with additional coconut oil before serving if you like. Serves 6. Don't Miss a Post. Subscribe here! Recipes, text, photos, and logo © greenthyme 2012. Material may not be used without permission.. Simple theme. Powered by Blogger.